A color pictorial postmark in shades of gold and red marks the date of issue for the Year of the Rooster stamp. The color postmark is printed on some first-day covers sold by the Postal Service. The United States nondenominated (47¢) Year of the Rooster forever commemorative is the 10th stamp in the current Lunar New Year series, which features illustrations by Kam Mak. The first United States stamp to be issued in 2017, appropriately enough, celebrates the new year. The nondenominated (47¢) Year of the Rooster forever commemorative will be issued Jan. 5 in a pane of 12, with a first-day ceremony in Seattle, Wash. The 11:30 a.m. event will take place at the Wing Luke Museum of the Asian Pacific American Experience, 719 S. King St.
Ceremony participants will include Greg G. Graves, U.S. Postal Service vice president of Area Operations, Western Area; Yibo Lu, director of Chinese Radio Seattle’s CRS office; Wing Lake Museum executive director Beth Takekawa; Chew Communications CEO Ron Chew; and Assunta Ng, founder and publisher of Seattle Chinese Post and Northwest Asian Weekly. The new stamp is the 10th in the current annual series celebrating the Lunar New Year. The artwork featured on each stamp in this series has been created by Hong Kong-born artist Kam Mak, who grew up in New York City’s Chinatown and now lives in Brooklyn. Mak’s artwork “focuses on some of the common ways the Lunar New Year holiday is celebrated,” according to the U.S. Postal Service. Mak’s illustration for the 2017 stamp depicts a colorful rooster on a red envelope, also known as a honbao, that is used to hold monetary gifts. Along with the 10 stamps issued thus far in the current U.S. Lunar New Year series, Mak also illustrated two 28¢ postal cards featuring koi that were issued together on April 17, 2009 (Scott UX555-UX556). He has illustrated children’s books, including The Dragon Prince by Laurence Yep, and The Moon of the Monarch Butterflies by Jean Craighead George, and has published his own illustrated book, My Chinatown: One Year in Poems. Mak’s work has appeared on the cover of Time magazine and in other prominent publications. The colorful and highly detailed illustration of the rooster on the stamp directly relates to the Lunar New Year symbol for the Year of the Rooster, which begins Jan. 28, 2017, and ends Feb. 15, 2018. Most of the previous stamps in the current series have not had such a direct link. Instead, the designs have shared cultural elements associated with New Year celebrations, including red paper lanterns, firecrackers, and drums. The 2012 stamp for the Year of the Dragon did include a bold dragon mask as its main feature. Like the nine stamps that came before it, the new stamp also features a small gold reproduction of an animal figure created 25 years ago by artist and designer Clarence Lee (1935-2015), whose cut-paper artwork illustrated the stamps in the first series of U.S. Lunar New Year stamps issued from 1992 to 2008. Another element on the new forever stamp also originated with that earlier series: the Chinese character for “rooster,” drawn in grass-style calligraphy by Lau Bun and also printed in gold. Similar calligraphy by Bun has appeared on every U.S. Lunar New Year stamp since the first was issued in 1992. Postal Service spokesman Roy Betts told Linn’s Stamp News that Lau Bun’s calligraphy character was lifted from artwork prepared for the first Lunar New Year series. Gold trim frames the design of the new stamp at top and bottom. The stamps are offset-printed with added microprinting in panes of 12 by USPS contractor Banknote Corporation of America. USPS art director Ethel Kessler also served as designer and typographer for the Year of the Rooster stamp. The Postal Service is offering an unspecified number of press sheets with die cuts for the Year of the Rooster stamp. 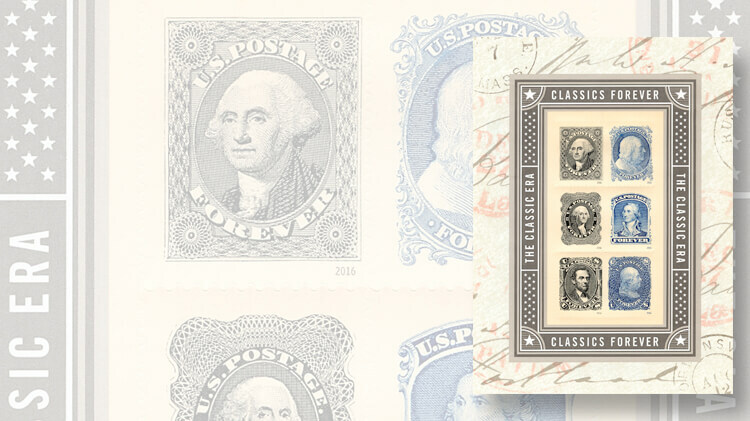 The sheets consist of six panes (72 stamps) and sell for the face value of $33.84. Standard USPS first-day covers for this issue use a black four-bar first-day cancel. A pictorial color postmark in what appears to be shades of gold and red showing Lee’s cut-paper rooster illustration is offered on a separate first-day cover selling for $1.62. Technical details and first-day cancel ordering information for the Year of the Rooster forever stamp are included in the box on this page. FIRST DAY— Jan. 5, 2017; city— Seattle, Wash., and nationwide. DESIGN: illustrator— Kam Mak, Brooklyn, N.Y.; with additional elements by Clarence Lee and Lau Bun; designer, art director and typographer— Ethel Kessler, Bethesda, Md. ; modelers— Sandra Lane and Michelle Finn; series— Lunar New Year. PRINTING: process— offset with microprinting; printer and processor— Banknote Corporation of America, Browns Summit, N.C.; press— Alprinta 74; inks— cyan, magenta, yellow, black, Pantone Matching System 872 gold; paper— phosphor tagged, block tagging; gum— self-adhesive; issue quantity— 15 million stamps; format— pane of 12, from 144-subject cylinders; size— 1.42 inches by 0.84 inches (image); 1.56 inches by 0.98 inches (overall); 7.24 inches by 5.92 inches (full pane); 21.97 inches by 11.97 inches (press sheet); plate numbers— none; marginal markings— “Celebrating Lunar New Year” (stamp side); “©2016 USPS,” USPS logo, bar code 552000, promotional text (back side); USPS item No.— 552004. Standard ordering instructions apply. 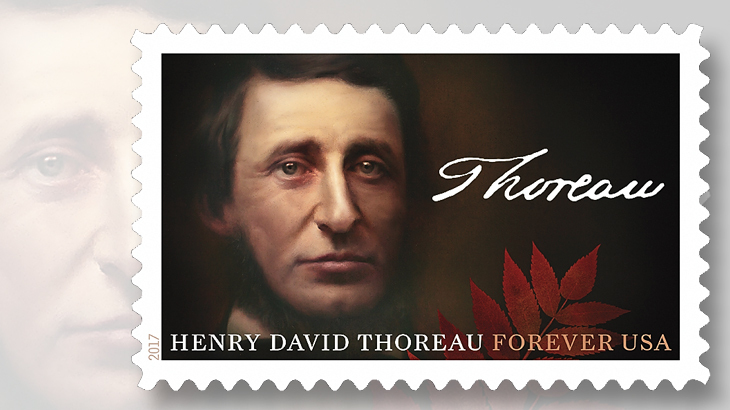 Collectors requesting first-day cancels are encouraged to purchase their own stamps and affix them to envelopes. The first-day cover envelopes should be addressed for return (a removable label may be used), and mailed in a larger envelope addressed to Year of the Rooster, Stamp Fulfillment Services, Cancellation Services, 8300 NE Underground Drive, Pillar 210, Kansas City, MO 64144-9998. Requests for first-day cancels must be postmarked by March 5. The Postal Service’s uncacheted first-day cover for the Year of the Rooster stamp is item 552016 at 91¢. USPS order numbers for stamps and FDCs also appear in Linn’s 2016-17 U.S. Stamp Program on page 34 of the Dec. 26, 2016, print issue.